For the last six years, (not coincidentally - since the introduction of the first iPhone in January 2007), AT&T has held their Annual Developer Summit on the day before the International Consumer Electronics Show in Las Vegas. In recent years the event has shown AT&T playing catch up to the latest trends in mobile devices, such as waiting until 2010 to introduce their first Android device, while Google was simultaneously announcing the Nexus One. In many ways, this year's event also had AT&T playing follow the leader, but this time they are also looking to pull in front, with a broad plan to push two nascent technologies straight into the mainstream: 4G LTE and the new Nokia-Microsoft Windows phones. First, AT&T CEO of Mobility Ralph de la Vega invited (a very excited) Microsoft CEO Steve Ballmer onstage to announce that the carrier will be the first to launch an LTE Windows phone. 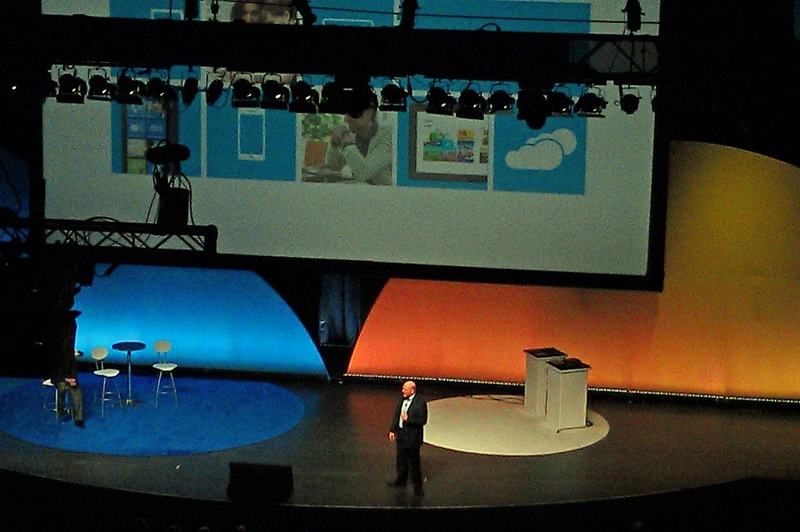 Ballmer was followed by Nokia CEO Stephen Elop, who spoke of re-introducing his company to the American market. Elop also announced that the first 4G Nokia phone would be introduced with AT&T, teasing the details that would come later in the day when the trio re-united at the (much smaller) Nokia CES Press Conference. With LTE-equipped Android phones now announced or available on all the major U.S. wireless carriers, the announcement of an LTE Windows phone (at least temporarily) has Apple lagging the field in 4G devices. Expect this to be corrected by mid-2012. For their part, AT&T made moves at CES to set a new low price point for LTE handsets, announcing that the new Pantech Burst and Samsung Exhilarate would be available for "under $50". 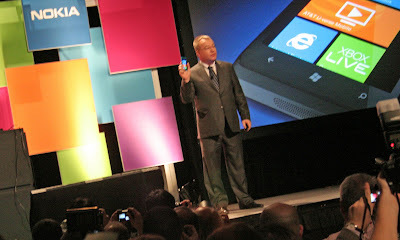 Including the Lumia 900, AT&T announced a total of 6 LTE phones, adding the Sony Xperia ion, the Samsung Galaxy S-II Skyrocket HD, and the 5.3" "crossover-device" Samsung Galaxy Note. A first reaction to the Galaxy Note was to recall a similar (failed) attempt at a large-smartphone/small-tablet, the Dell Streak. Would consumers want to carry such a large phone? The Dell Streak felt very awkward to use to make a voice call. With the Kindle Fire just beginning to make some headway for smaller-than-iPad 7" tablets, would consumers go for a 5" device? 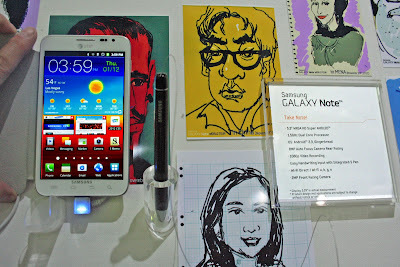 In the Galaxy Note Samsung has made a greater effort to differentiate their product than Dell had, by featuring a new user interface - a stylus input that has 256 levels of pressure sensitivity. Samsung showed off this feature by having artists create caricatures of CES attendees at several venues throughout the show. In a brief hands-on evaluation, the Note was much more impressive than the Dell Streak had been. Its 5.3" AMOLED display is just that much more dazzling than it already is in the smaller Galaxy smartphone form factors, with capability for 1080p video. With the addition of 4G LTE connectivity, the Note is no laggard in technical features. Samsung has made their "S Pen" SDK available to developers, so it will be interesting to see if the device is successful in stimulating creation of a new class of apps to take advantage of the stylus input. EE Daily News will be presenting at the annual Santa Clara Valley chapter of the IEEE Consumer Electronics Society's "CES Download" on January 24th. The event may be sold out, so if you can't attend look for the presentations to be posted after the event. "With LTE-equipped Android phones now announced or available on all the major U.S. wireless carriers"
Wait, what? T-Mobile? T-Mo has no LTE. Or do you just not consider them a major carrier anymore? You are right, I did discount T-Mobile, the 4th largest of the U.S. carriers. They have very large gaps in their U.S. coverage, especially in the western states. I generally consider the top 3, ATT, Verizon and Sprint as the "major" nationwide carriers and T-Mobile as leading the lower tier.